If you haven’t already sent us the birthday dates of your scotties to include in our calendar, why not do so now. At the same time, you could add a photo of your beloved Scottie for inclusion in a ‘birthday post’ on their special day. So get snapping those scotties! 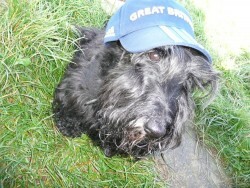 Whilst I’m at it, I’ll wish my very own beloved Scottie “Bobby” a very very happy 11th birthday. He will most certainly have a grrrreat day! This is my Scottie, Valentina Madison, known as Maddie, born February 18, 2004.